There are thousands of keyboards you can buy starting from under $100 and going well over $1000. So how do you pick the best keyboard for beginners? When picking an instrument, you have to look for the “balance”. A $3000 keyboard won’t make you a pro right away, and the number of features and options will drive you crazy. A $20 keyboard may seem like a good idea to start, but do you want it to break in a couple of weeks or for a key to stop working all of a sudden? I am sure you don’t. Here are the top 5 pick of best keyboards for beginners. The detailed list is just below that! What To Consider When Buying a Keyboard? Do I Need A Keyboard Stand? Do I Need A Keyboard Bench? Let’s look at the keyboards for people who are just starting and go over the main features. This electronic keyboard has an authentic tone and slick design. It’s also one of the best bangs for the buck that Yamaha offers. To make it portable, Yamaha developers removed two octaves and made it a 61-key model. There are only ten voices, but you also get sixty-four notes of polyphony. Not the best settings, but you honestly don’t need anything else if you are just starting. It’s sampled from the Yamaha Grand Piano, so expect a lot of brightness and high-quality sound. Does this keyboard have any extra features? Well, it has a lot of other sounds (not just the Grand Piano) to play. There is also a metronome button that will help you keep the pace well. Another cool perk is its compatibility with a sustain pedal, which not all electronic keyboards on the market offer. They are semi-weighted actually. It’s a good start for beginners who want to try playing the keyboard. Does it need to be powered? It has 6 AA batteries and up to 16 hours of battery life. You can also use it as a MIDI keyboard if you connect it to your PC or laptop. Does it come with speakers? It comes with two 12cm X 6cm speakers. The coolest thing about this keyboard is that the keys you play light up. Surprisingly, this feature made this keyboard one of the most popular in the industry for a period of time. The sound bank offers you 110+ songs, which is a goldmine for every beginner out there (want to learn more songs for keyboard and piano?). The keys will light up as the preset song will play. Section by section, you’ll be able to learn a bunch of songs one after other thanks to the light up keys and a fantastic song bank. Is Casio LK-190 for everyone? Not really. A lot of people believe that you should train your muscle memory and your ear as opposed to just memorizing the keys that light up and patterns they create. If you have an old-school instructor, he or she will most likely be against it. However, it’s still a very popular keyboard with a lot of neat features. What feature does Casio LK-190 have? Well, the most simple one would be an onboard metronome that helps you develop the sense of rhythm. You also get a sampling function that lets you use different sound pads and reverbs when playing the keyboard. Does the keyboard have any other cool perks? Yeah, it’s sustain pedal compatible and is MIDI capable. You don’t see these perks on the lower side of the price spectrum keyboards. A fantastic bang for the buck. Huntington is not a “big name brand” like Casio and Yamaha. However, it’s been around making drums, keyboards, and guitars for a while now. The KB61 is not a fancy keyboard. It’s a budget alternative for more expensive Casio and Yamaha keyboards. This keyboard for beginners comes with 61 keys with are not weighted at all. This is both a pro and a con at the same time. You may want the weighted keys to get the feel of a real acoustic piano. Or maybe you don’t feel like overcomplicating your training with a wide range of notes and notes velocities. It’s all is up to you. What are the features of Huntington KB61? Well, it’s price is definitely a perk as it’s one of the cheapest keyboards for beginners on the market. Moreover, you get a hundred different voices and tones, with a hundred various rhythms to choose from. Does it have any special effects? Unfortunately, there are no special effects. If you are looking into adding sound pads and reverbs, then check out the previous keyboard on the list. And for such low price, you are definitely getting a sweet bang for the buck. With Yamaha PSR-F51 you get another excellent 61-key keyboard with a lot of sweet features. The interface is very easy to navigate through, and its sound bank includes 120+ voices. How about 114 backing styles so you will never run out of ideas. All you really have to do is select a voice and a rhythm, and you are good to play! Is this keyboard okay for beginners? Actually, it has a colour-coded and intuitive workflow panel that is designed specifically for beginners. And the built-in metronome will help to develop your sense of rhythm also! It’s entertaining to play with because you can always change the voices and the tones. You also get instruments from all over the world that you can try? The PSR-F51 is incredibly easy to use with its color-coded, intuitive control panel. Simply select a voice, choose a rhythm and start. It's as simple as 1, 2, 3 ! This is one of the cheapest Casios that you can find on the market. However, don’t let the price trick you into thinking that it’s poorly built or is cheaply made. It can’t come close to $1000 and even $300 keyboards, but for the price, it does everything it has to and more. It also only has 44 keys, when the rest of them have at least 61. What are Casio SA-77 features? This keyboard for beginners has all the essential every newbie needs while learning the fundamentals. It offers a hundred timbres and fifty rhythms. On top of that, you get ten songs in the song bank, which will take you quite some time to learn and master. You can use a switch to change from the piano to the organ mode and back. The LC screen helps you with quite a few things as well, as it’s designed for a smooth workflow mostly for beginners. Casio SA-77 definitely doesn’t look as “cool” as the rest on the list, but it sure is excellent. Best bang for the buck if you want to go with a well-known brand for sure. A lot of people pick the piano or keyboard as the first instrument to play. The reason for this is because learning the piano fundamentals will make learning everything else a lot simpler. It’s a must to understand how chords and scales work. And it’s a lot easier of a concept to grasp when you are learning the piano. Because it’s similar to learning to play the guitar with just one string. Each key equals one note. Moreover, developing “an ear” for music, in general, is simpler with a piano or a keyboard. You technically still have to tune them, but it’s so much easier than any other instrument. Are you more into keyboards and digital pianos? Well, you don’t have to tune them at all. You can tweak settings up to your liking, and they will maintain perfect pitch. Does It Have To Be Pricey? Not at all. Back in the days, only the finest houses would have a piano in the living room. They were bulky, heavy, and expensive. Thank god, those days are long gone. Today you’d be much better off with a portable keyboard or a digital piano. 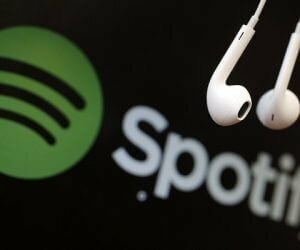 They are easy to move, and you don’t have to tune them at all. Modern keyboards are not very expensive either. Of course, you pay extra for the features, but it’s still affordable. 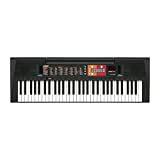 There are quite a few things to consider when purchasing a keyboard, especially if you are a beginner and don’t know a whole lot about music to start with. If you don’t know that yet, a regular piano has 88 keys. Yes, everyone wants the keyboard that is the “most accurate” representation of an actual piano. But do you really need 88 keys? A classical acoustic piano has seven octaves and a few extra keys on the top of that. The thing is that you are unlikely to find a song with these many octaves being played at the same time. Only a few really complex pieces and, of course, the classics. A lot of professionals suggest getting 76 or 61 keys. And even 49 keys will be sufficient for the first year at least. Most of the time you will be good with a table. However, there are better alternatives that won’t break your bank. 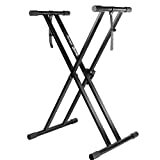 You can purchase a keyboard stand or a rack for reasonably cheap these days. 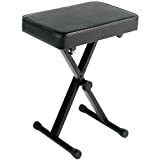 Check out this Rockjam Keyboard Stand. Again, it’s not a must. However, it’s an essential piece of furniture to consider if you are taking playing the keyboard somewhat seriously. Similar to the keyboard stands, they won’t break your bank. If you are considering this seriously, getting a keyboard bench will be beneficial and will pay off in the long run. Check out this Yamaha keyboard bench. This is probably the #1 question that is being asked by beginners who want to start playing the keyboard. If you plan on moving on to playing the acoustic piano in the future, you are better off with weighted keys. You fingers will get used to the resistance that the mechanism in the piano offers. Note that the keyboards with weighted keys are harder to build, so they are more expensive in general. It’s not as crucial as you’d think. Alright, we’ve gone over a few things regarding the keyboards and can finally move on and look at the best piano keyboard for beginners. When you are just starting to play the keyboard, you are still high on emotions and want to get the best thing out there. But sometimes a $50 keyboard will end up doing better than a $500 one because you don’t need all the features the latter one offers. It’s going to take some time to master even the easiest and simplest keyboard out there with no extra features and build some fundamentals and skills. You should check out this PianoForAll course. It offers you 9 ebooks, 200+ videos, and a step-by-step tutorial for a one time fee. When mastering the piano, the learning curve can be steep, but PianoForAll will sure make it a lot better. So how about you give it a shot?